Think the existing Mars rovers or the lunar dune buggies from the Apollo days were fun? 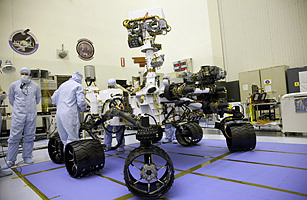 Wait till Curiosity  an SUV-size rover that left Cape Canaveral in November  arrives on Mars on Aug. 6. The rover will be the biggest, most capable machine on the Red Planet by far, and it will get there in an improbable way  plunging through the Martian atmosphere, slowing itself down with parachutes and air resistance and then being lowered by cables from a hovering propulsion shell. A first act like that will be hard to follow, but the second act  at least two years of Martian exploration  will probably be more than up to the job.